In order to help people understand how the contexts that we've developed can and should be used, we have put together a helpful Researcher's Guide (PDF). This introductory summary discusses the organization, content, and development of the context. It defines historical farming systems and how historical regions are identified. It contains basic principles that will be applied throughout the Commonwealth. The time frame for analysis extends to 1960, a watershed decade that saw dramatic transformations in production agriculture. This section provides an overview of agriculture for all of the farming regions outside southeastern Pennsylvania in this period. Topics such as products, labor and land tenure, and buildings and landscapes introduce the reader to various aspects of farming. The Adams County fruit belt developed in the late nineteenth century, aided by new transportation links, successes by local innovators, and a plague of pests that wiped out many trees across the state, creating a competitive opportunity for growers who were willing to spray. Between 1905 and 1925, Adams became the state's first-ranked county in apple production. Major shifts in the mid-twentieth century included changing varieties and processing uses; new cultural techniques; vertical integration between growing and processing; greater specialization on farms; increased activity of the state land-grant apparatus in the industry; and the use of migrant labor. Includes: Several townships in northern and western Adams County. Farming here was intimately related to mining, industry, and lumbering; it was a part time enterprise aimed at subsistence. Women played a disproportionate role in farming while men worked at other jobs. Immigrants from eastern and southern Europe acquired farms by the twentieth century. Includes: Much of Westmoreland, Fayette, Somerset, Cambria, Clearfield, McKean, Indiana, Jefferson, Cameron, Clarion, Venango, Forest, Elk and Armstrong counties and the portion of Centre County that lies behind the Allegheny Front. A high level of mechanization, a high rate of farm tenancy, high livestock numbers, a large ratio of cropland to grassland, a Pennsylvania-German cultural influence, and narrow valleys characterized farming systems. Landscape features may include barns and outbuildings that reflect machinery use and storage, tenant farms or houses, housing for livestock, Pennsylvania-German construction, siting and building types, and a landscape pattern of linearity with farms sprouting off of one road. Includes: Portions of Bedford, Fulton, Blair, Huntingdon, Centre, Union, Mifflin, Snyder, Juniata, Clinton, and Montour counties. During the colonial and early national periods, farming in this region featured diversified small-scale production with substantial production of wheat for export. As domestic markets developed, farming families in the region shifted to a highly diversified grain and livestock system. During the twentieth century farming families added to this system more products geared to local markets, especially poultry raising and dairying. The horse slowly gave way to the tractor. In the two decades after World War II, families specialized more and shifted completely to petroleum-based production. Off-farm work became increasingly important to sustaining farms. Throughout the Great Valley, farming landscape was shaped by Pennsylvania German customs, especially foodways and kinship-based share tenancy. Includes: Much of Franklin, Cumberland, Lebanon, Berks, and Northampton Counties, and portions of Dauphin, Schuylkill, and Lehigh Counties. Between about 1850 and 1965, intensive fruit and vegetable culture occurred here, stimulated by suitable soils, a mild climate, and rail connections to markets. At first,general crops and livestock were raised here, along with many fruits and vegetables including grapes, apples, cherries, and truck garden produce. After about 1925, fruit culture took the place of diversified farming. Concord grapes for juice were the main product. The labor force first consisted of local women, and later migrant workers harvested in the region. Includes: A 4-5 mile wide strip along the Lake Erie Shore in Erie County. The Lancaster Plain has some of the best agricultural conditions in the United States. Between 1730 and 1780, this region saw diverse production for diverse uses, however, crops were the main focus. From the end of the eighteenth century to the end of the Civil War, the colonial-era system was reworked into a crop and livestock farming system. After the Civil War to about 1920, both poultry and dairy farming was emphasized and tobacco provided an important income source on a per-acre basis. The last period, from 1920 to 1960, saw a decline in tobacco farming and an increase in dairy, poultry, and truck farming. Includes: The north central portion of Lancaster County. 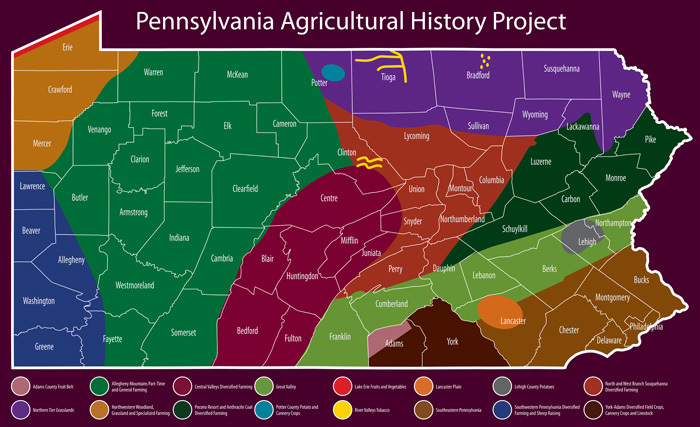 The Lehigh potato region developed within the Great Valley. Between about 1850 and 1910, potato culture was one component in a diversified system shared with other Great Valley locations. From 1910 to 1960, the region became the state's leading potato producing area. Potatoes became the primary cash crop in a system with diversified sidelines. The potatoes were shipped mainly to eastern cities. Distinctive potato cellars and barn adaptations were the main landscape manifestations of potato farming. Includes: The northern portion of Lehigh County, and the northeastern corner of Berks County. The North and West Branch Region had three distinct agricultural periods. Between 1840 and 1860, improved transportation systems allowed farms to change production to corn, wheat, pork, and butter. The second period involved a diversification of farm production for sale to local mining and industrial towns, and a dramatic increase in population levels between 1860 and 1940. From 1940-1960, the chief changes affecting agriculture were technological: the switch to combustion power from horses led to a re-structuring of crop patterns (since horse feed was no longer needed), and electrification eliminated the need for ice houses, spring houses, and even summer kitchens. Includes: Portions of Northumberland, Montour, Columbia, Snyder and Lycoming. Four historic farming systems can be identified in the Northern Tier Region from settlement to 1960. These are the period from settlement to about 1830, the period of farm-making; from about 1830 to about 1860, a diversified woodland, grassland, and livestock economy;1860-1900, when diversified home dairying dominated; and 1900-1960, when fluid milk dairying and poultry production were emphasized. Includes: All of Tioga, Bradford, and Susquehanna counties, as well as parts of Potter, Wayne, and Sullivan counties. From about 1830-1865, farms in the region pursued home dairying (especially cheese making), sheep grazing, exploitation of woodlands, and raising livestock for finishing further east. Between about 1865 and 1900, cheese production shifted entirely to a factory system. Home butter making continued, augmented by woodland products and hay. After about 1900, fluid milk dairying was increasingly emphasized, and ancillary enterprises included ventures like truck farming. From 1945-1960 the region became specialized in dairying. Includes: Major portions of Erie, Crawford, Lawrence, and Mercer Counties. Between 1860 and 1940, there developed a diversified farm economy mixing vegetable, fruit, poultry, dairy, and hay production, all for local markets in either the tourist region or the mining cities. The peak was around 1915 but after that the previous patterns of mixed farming continued, more mechanized and with a greater role for dairying and poultry raising. Part-time farming was important here. After the Second World War, agriculture declined. Includes: nearly all of Pike, Monroe, Carbon, Schuylkill, Luzerne, and Lackawanna Counties; the southern portions of Wayne, Columbia and Northumberland Counties. Diversified home dairying and potato production characterized the time period from 1850-1915. From 1915-1940, dairy, poultry, and potato products were the most important components of agriculture. From 1940-1960, migrant workers were employed to harvest potatoes and cannery crops. Includes: The northern two-thirds of Potter County. From about 1870-1930, tobacco was raised in several small, concentrated areas of central Pennsylvania and the Northern Tier. In sheltered and fertile river bottom lands, farmers raised cigar-leaf tobacco as a complement to the regionally typical crop mix. They cured the crop in New England style or Lancaster County style tobacco barns. Includes: Susquehanna River and tributary valleys in Bradford, Tioga, Lycoming, Clinton, and Snyder Counties. Agricultural production and land use decisions have been historically shaped by this region's close proximity to Philadelphia. During the colonial period, Philadelphia's port was used to send goods along the coast and to Europe. By the early nineteenth century, western competition shifted production to home butter dairying. At the end of the nineteenth century, fluid milk dairying, market gardening, and ornamental horticulture became important sources of farm income. These three income sources continued into the twentieth century with the addition of poultry raising. Includes: All of Bucks, Montgomery, Philadelphia, Delaware, and Chester Counties, and portions of Lancaster and Berks Counties. From c. 1830-1850, agriculture was highly diversified. A sheep boom followed, when fine-wool sheep raising was followed on a large scale, on top of a diverse subsistence base. The sheep economy declined rapidly thereafter, as did agriculture more generally. Part-time, relatively small-scale farming characterized the region in the twentieth century. Includes: All of Washington and Greene Counties and portions of Beaver, Mercer, Allegheny, and Lawrence Counties. Farming in this region evolved in four major phases. Diversified small-scale farming was prominent from the mid-eighteenth century to about 1830. During the period between 1830 and 1885, highly mechanized small farms combined livestock and crop production for new markets. These were mainly local and regional and were oriented towards Baltimore. Between 1885 and 1940, the system shifted so that cannery crops, orchard products, and poultry farming were emphasized. Baltimore lost importance to other markets and York became one of the nation's leading poultry counties. The last system, from 1940 to 1960, was characterized by more specialized, capital intensive and larger scale farming. This was accompanied by a rapid loss of farms and a greater reliance on off-farm income. Includes: Nearly all of York County and a large portion of Adams County. This selected bibliography has been compiled with the goal of furnishing guidelines for research on the history of Pennsylvania agriculture. Important resources are listed here, but more appear in the individual narratives. National Register eligibility with respect to agriculture will depend upon how well a given property reflects the historical farming system in that region. Property Types and Registration Requirements for National Register Criterion A, B, C, and D are contained at the end of each regional context document. Registration Requirements for Criterion A under Agriculture vary from one region to another. Registration Requirements for Criteria B, C, and D are statewide, but for convenience they are included in each regional context narrative. They appear near the end of each narrative. This Statement of Integrity discusses the seven categories of integrity (location, design, setting, materials, workmanship, feeling, and association) as defined by the National Register, for each of the Property Types (farmstead, farm, and historic agricultural district) defined in this context. For convenience, the link here leads to a collated listing of Property Types and Registration Requirements for Criterion A, B, C, and D for the "Settlement Era" period narrative and all of the sixteen regions. Registration Requirements for Criterion A under Agriculture vary from one region to another, while Registration Requirements for Criteria B, C, and D are the same statewide. 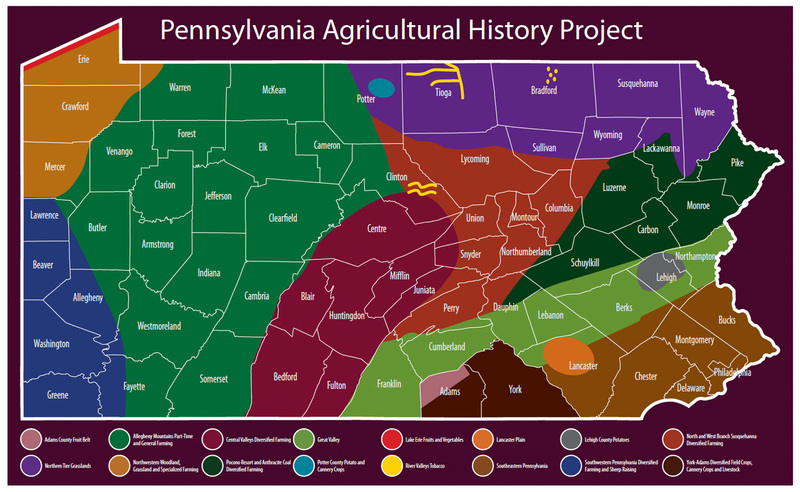 Each regional context narrative contains the Criterion A requirements for the specific region, along with the statewide requirements for Criteria B, C, and D.
This is a static, archived version of the PHMC Pennsylvania Agricultural History Project website which will not be updated. It is a snapshot of the website with minor modifications as it appeared on August 26, 2015.